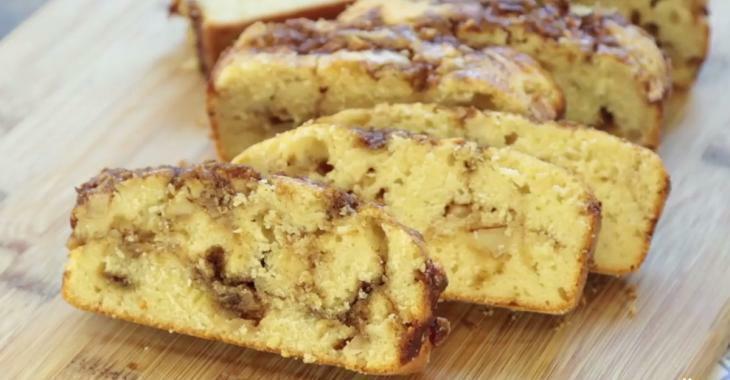 Kitchen : Apple and cinnamon bread, you'll always want to prepare one! Apple and cinnamon bread, you'll always want to prepare one! This way of using apples is just perfect! A super easy-to-make bread, moist and full of delicious apple chunks! Preheat the oven to 350 degrees F and butter and flour a bread pan. In the bowl of your electric mixer, whisk the butter until smooth, then add white sugar while whipping. Add the eggs and vanilla, mix. Gradually add flour, baking powder and milk. Do not mix too much. Pour half of the dough into the prepared dish. Spread half of the diced apples and half of the mixture of cinnamon and sugar. Pour the remaining dough over the apple layer, then spread the apples and the remaining sugar mixture, press a little bit on the apples.